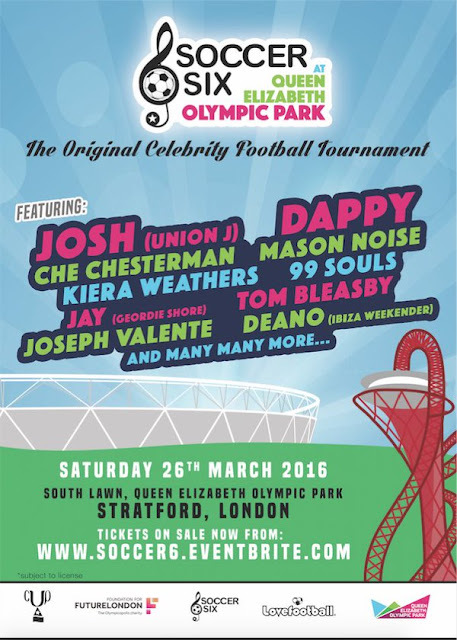 The first line-up announcement for Soccer Six in March has been made! If you don't know what Soccer Six is, it's where a bunch of celebrities from music, TV, comedy and social media, all join together for a bit of a kick-about. It's all good fun and offers fans the opportunity to watch their favourite stars play football and even meet them on the day. The next Soccer Six tournament will be the first of 2016. 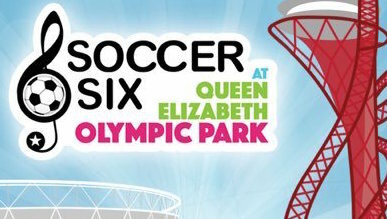 Excitingly, it will be held at the Queen Elizabeth Olympic Park in Stratford on Saturday 26 March. So far, the tournament is set to be star-studded with the likes of boyband Union J's Josh Cuthbert, Dappy, as well as recent X Factor finalists, Che Chesterman and Mason Noise heading onto the pitch. In addition, there'll also be famous faces from reality TV such as Jay (Geordie Shore), Joseph Valente (The Apprentice) and Deano (Ibiza Weekender) making an appearance. Check out the first line-up poster below and remember, there's many more to come! Follow Soccer Six on Twitter to stay updated on news, competitions and be the first to hear when more celebrities are added to the line-up! Want more news on the latest artists? Follow us @HDMusicPromoUK and 'like' us on Facebook.